The Acoma Pueblo is believed to be the oldest continuously inhabited community in the United States, occupied since the 12th century. Also known as "Sky City," Acoma is located 40 miles west of Albuquerque on a 400 foot sandstone butte. Acoma is well known for their beautiful earthtone pottery with designs of ancient interpretation. 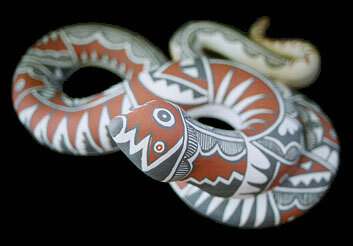 The snake represents transmutation, life, death and rebirth.